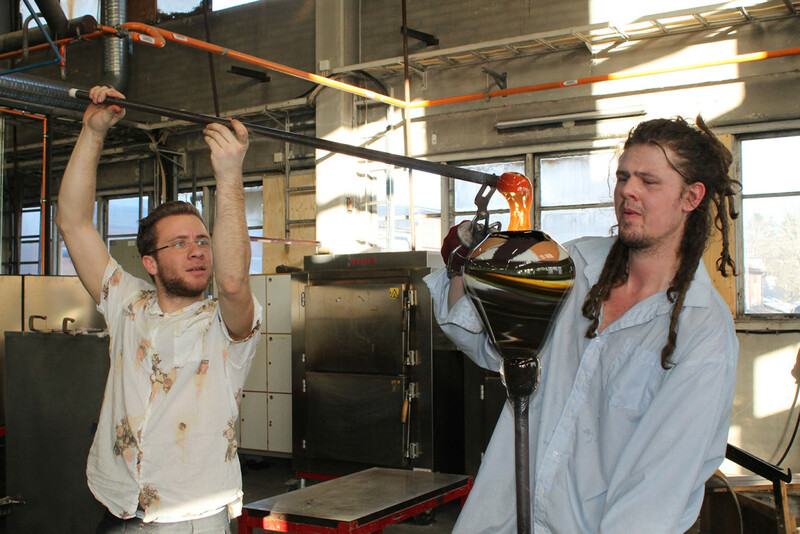 The National School of Glass has a long tradition. We have educated students since 1969, when the education was meant to prepare workers for production work. Today, the education is more diverse and prepares students for both production and unique work. Until recently, our school has been located next to the famous Orrefors glass factory. Today we are located at the glass factory in Pukeberg, Nybro. We teach glass blowing and glass Cold working.. Most of our students come from the Nordic countries (Sweden, Denmark, Norway, Finland, Iceland) and participate in structured, degree program which are financed by the Scandinavian governments. We also accept independent students from the rest of the world. These students are responsible for financing their education and can choose to study 1 to 4 semesters. Please see attached “price list”. We have a staff of four teachers all with a long experience of working with glass before starting to teach. We complement each other with a broad knowledge about different glass techniques. Nybro is a small town in the southern part of Sweden and the landscape Småland. Nybro is also a part of the famous Kingdom of Crystal-region. There are train connections to Nybro from the international airports in Stockholm (Arlanda, Skavsta) and Copenhagen (Kastrup). It is also close to the local airports in Kalmar and in Växjö. We teach students in traditional Swedish glassblowing techniques: mold-blowing, free-hand blowing (shaping with newspaper), underlay and overlay techniques (Graal, Ariel, Ravenna), stem-pulling, foot shaping with graphite tool and in newspaper, blown feet, handles, trimming the lip, and different cut-on ornaments and decorations. In the cold workshop, we teach students how to grind and finish their pieces. We also teach engraving, flower cutting, deep cutting, and sandblasting. We offer introductory courses in bead making, fusing and slumping.